Refer A Friend and Earn $50 off your yearly service for every referral that becomes a termite and pest control service plan customer. Refer a Friend annual service plans include termite inspections, termite treatments to active and infested areas, WDI reports and unlimited pest control extermination treatments. 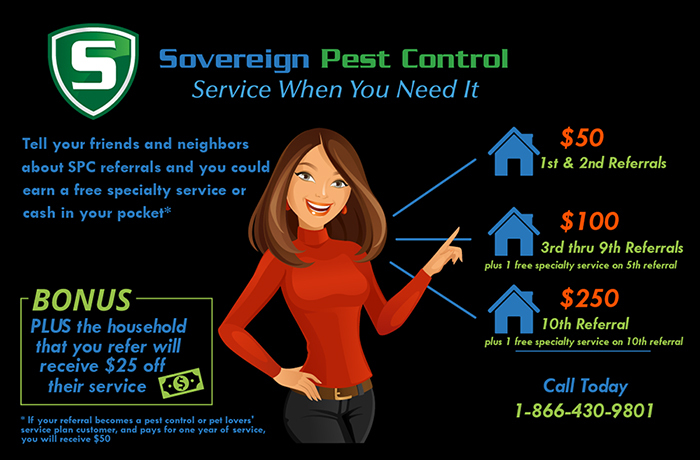 In addition, Sovereign Pest Control offers a variety of Specialty Services. Specialty Services include (Mosquitoes, Fly Prevention, Bee, Hornet & Wasp Removal, Pantry Pests, Stink Bugs, Box Elder Bugs, Cicada Killers, Fire Ant Service, Outdoor Party Service, Yard Service & Pet Lovers Service). All you have to do is submit the information on the form below. With no limit on your ability to earn; start spreading the news to friends, relatives, co-workers and neighbors! The more you refer, the more you save on your service.